The new pocket size edition of Rosetta. Black borders, English titles, remastered printing with colors true to the original artworks! Signed and numbered edition of 250. 83x55 mm, picture shows size in comparison to full size. 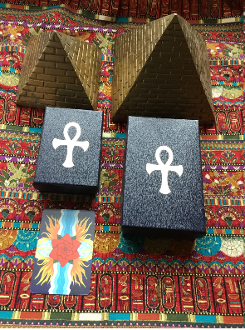 Comes in a heavy duty, satin lined box that matches the full size Papyrus edition, and comes with a matching suede-like bag that the box fits into. Includes customizable significator card!